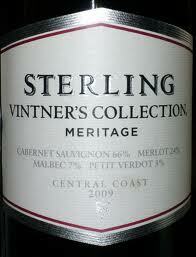 Wine Review: 2009 Sterling Vineyards Vintner’s Collection Meritage | Wine Splash! Very impressive Bordeaux blend that is mostly Cabernet Sauvignon and Merlot (with some Malbec & Petit Verdot). We bought this bottle for $9.99 and it tasted better than most $25 Bordeaux wines! We have had some very decent wines from Sterling Vineyards and most of them we would rate somewhere between 82-86 points…very respectable. But honestly, this 2009 Meritage really blew us away! A very nice garnet color with good legs. Whimsical on the nose with notes of cherry, dark berry, and a hint of spice. On the palate, this wine has a full, rich mouthfeel. It is bursting with flavors of blackberry, ripe plum, cedar, and cinnamon spice. Great balance of fruit and spice which leads to a long, vanilla oak finish! Wonderful tannin structure which is warm, firm, and youthful. We definitely recommend this wine as one to try; it would pair perfectly with red meat with a spicy barbecue sauce, spicy marinade, or tomato pasta sauce. We give the Sterling Vineyards VC 2009 Meritage an 91 on the SiNoTas scale. All the right flavors, all balanced and an edgy, provocative finish. Drink now – 2014…. but we can’t help but to drink more right now! WineSplashing….. Learn more about their wines at www.SterlingVineyards.com. I reviewed this wine a while back, and also was quite impressed! Thanks for sharing. Always nice to compare notes! Thanks for the comment! Looks like we may have the same impeccable taste in good wines. LoL! We liked your Michigan and German tasting recently. Very interesting and alot of great information! We will keep in touch! Cool! And thanks for the comment. I recently tried the 2009 Cabernet Sauvignon and also found it to be quite good. I’ve had the Meritage as well and if push came to shove I would choose the Meritage over the Cab. Cheers! Thanks for the response and the tip, Jon. Its been awhile since I had the Sterling Cabernet but the last time I had it, I was pleasantly surprised! I will have to do some research and see if there are any 2009 Sterling Cabs still out there. I am hearing that California has had some great harvests from 2009-2011 and most of those wines are supposed to be pretty good. So maybe the 2010 Sterling Cab & Meritage are just as good as its predecessor. Looks like we have the same palate. Happy New Year, Jon! Just had my first experiance with this very pleasant wine. Will be adding it to my cellar as a regular. Hi Frank, I am glad you liked the Sterling Meritage too! I think I just saw a 2011 vintage so I am going to pick that up before Christmas. If you have already had the 2011, let me know if you liked it. Have a great holiday, Frank!